A while ago we were invited by Amsterdam based architecture and planning firm One Architecture to collaborate on a research project about the possible future of urban planning and policy in the Netherlands. The project was commissioned by Deltametropool Network for Metropolitan Development. 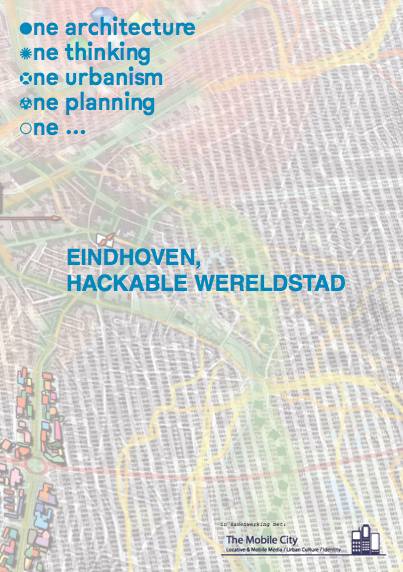 One of the outcomes of this collaboration is the publication ‘Eindhoven Hackable World City‘ (in Dutch, pdf 2.2 MB) in which we present our ideas about the future of the Eindhoven city region, and the role of technologies therein. Traditional urban planning in the Netherlands with top down master plans and large scale area development is over. This is partly due to the financial crisis, demographic change, peak mobility, and the digitization of urban society. The challenge of large future investment projects is to optimize and make better use of existing resources. Cities will have to adapt in flexible ways to changing circumstances. This implies an important conceptual shift in thinking about city making: it is less about individual possession and more about the question how multiple stakeholders can make use of the various resources that the city offers. Digital media play an essential role in developing the instruments that allow a shift of gears to happen. The question is: how are we going to make use of these technologies? On the one hand local governments, technology companies en knowledge institutions are forming consortia to turn cities into ‘smart cities’ with the aid of informatics. Digital technologies are used to optimize urban processes and make them more efficient, like mobility and healthcare. On the other hand citizens and cultural organizations are increasingly often taking matters into their own hands. Tapping into the online culture and ethics of do-it-yourself (DIY), they take ownership over their city and undertake collective action: from collaboratively maintaining urban gardens to creating sensor networks to measure noise pollution or air quality. We think these initiatives are too isolated to really offer a sustainable future perspective on urban transformation. The smart city departs too much from a utilitarian view of the good city but forgets the public domain and diversity of identities of urbanites. The bottom-up initiatives in the so-called ‘social city‘ on the other hand are often too fragmented. They are insufficiently connected to institutional stakeholders and lack impact and scalability. They also sometimes suffer from a ‘people-like-us’ mentality that seems to implicitly yearn for small-scale sociability rather than drawing on the potential of complex and heterogeneous city life. These developments take place all over the world. In the Netherlands the city of Eindhoven is one of the most interesting places. In few other cities the divide is as big between high-tech business innovation occurring at the city periphery and inner city urban (sub)cultures. In this proposal we pose the question: how can we better connect ‘smart city’ and ‘social city’ in Eindhoven through research and design? The challenge is not to fall in the same trap of attempting to construct yet another grand narrative for top-down urban planning. We are more interested in exploring and creating the conditions for urban ownership of citizens and organizations. Can we connect businesses, governments and the cultural and societal sectors to collaboratively make Eindhoven a truly smart hackable world city with the aid of digital media technologies?